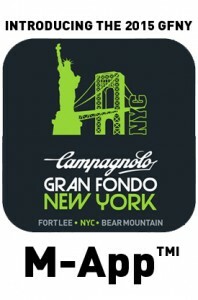 NEW YORK CITY, April 13, 2015 Gran Fondo New York Inc. introduces the M-AppTMI, an informational, analog tool for riders to navigate race weekend at the fifth annual Campagnolo Gran Fondo New York on May 17, 2015. M-AppTMI‘s main feature is its pre-installed content: the course map and time sheet are on one side of the jumbo folding M-AppTMI while climb profiles, gear recommendations and schedules are on the other side. M-AppTMI fits easily in one of the five pockets of the official Campagnolo Gran Fondo New York jersey manufactured by Biemme. Riders won’t ever have to take out M-AppTMI to navigate the course thanks to ample course signage and police controlled intersections. M-AppTMI will, however, be extremely useful for the athletes to discuss race strategies during the wait at the start on George Washington Bridge and to review the race with their teammates during the pasta party at the GFNY Finish Village. Fully extended, M-AppTMI has a 27″ diameter in extremely high definition with a great touch and feel. M-AppTMI is based on wood which ensures a life that is expected to exceed any digital app currently on the market. 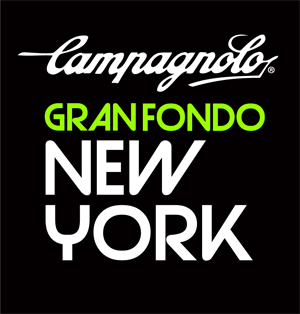 All participants of the 2015 Campagnolo Gran Fondo New York receive the M-AppTMI for free exclusively at the NYC Bike Expo M-AppTMI Store on May 15 and 16 at Penn Pavilion in Midtown Manhattan (7th Avenue and 33rd Street). GFNY WORLD now features events in Italy, Mexico, Colombia, France and Argentina. Campagnolo Gran Fondo New York raises funds for Operation Smile, the international children’s medical charity.